Dark Horse Comics is launching a digital comic book application in January, as they announced at their New York Comic Con panel today. The bookshelf application will be made available on the iPad, iPhone, and iPod touch, with an Android app to follow shortly after. The digital comics will be priced at $1.49, lower than the price of most digital comics from the Big Two publishers Marvel and DC Comics, which Hershman said would help make comics content more appealing to new readers. There will also be bundled collections of three to four issues priced from $2.99 to $5.99, and some content will be released simultaneously in print and digital format, according to Director of Publicity Jeremy Atkins. These simultaneous sales will begin in February 2011. The application is proprietary -- made by Dark Horse -- which VP of Publicity Micha Hershman said would mean no censorship, as they would not have to submit content for approval to Apple, allow them avoid licensing fees, and help them pay creators a greater percentage of each sale and charge readers less.The bookshelf application will launch with over 150 titles, including "Hellboy," "The Guild," "Serenity," and "Mass Effect," and any device with a modern web browser will be able to access Dark Horse digital comics. Hershman estimated that more than 20 books would be released digitally each month. To try and allay fears about the impact of digital comics sales on brick and mortar stores, Dark Horse will also be offering some digital content available exclusively through traditional comic book shops, with details to come. 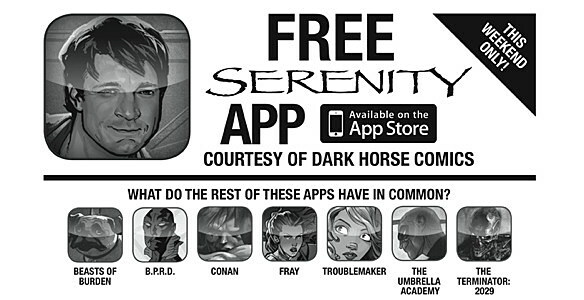 For this weekend only, Dark Horse will also make eight digital comic book apps available through the iPhone store, including "Serenity," "Beasts of Burden," and "Umbrella Academy."